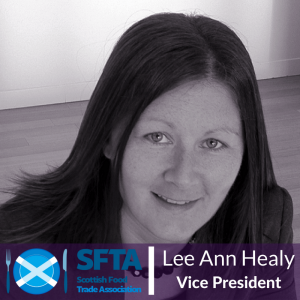 Lee Ann Healy Appointed as Vice President of SFTA. With September being the month where the spotlight is well and truly on the Food and Drink industry across the UK, it is a time to celebrate home grown produce and support British manufacturers. With this in mind we are delighted to announce that Optimum PPS Managing Partner, Lee Ann Healy, has been appointed as Vice President of the SFTA (Scottish Food Trade Assocation). Lee Ann and the wider Optimum team have plenty of Food and Drink experience and have kicked off multiple projects in the sector recently with the likes of Loch Fyne Oysters, Muller Milk & Ingredients, Allpress Farms and Proctor’s. Lee Ann Healy stated ‘’I am delighted to have been appointed Vice President of the SFTA. It’s exciting times for the food and drink sector and I relish the opportunity to play an active role in helping Scottish businesses in the sector grow and develop – it’s something I’m very passionate about”. The SFTA are now planning events and meetings on a bigger scale to meet the demands of the industry. Networking breakfasts, factory tours and hosting key note speakers to share their insights are just some of the events to be announced in the coming months. There will be plenty on offer to both existing members of the SFTA as well as new comers. For more information on the events, activities and becoming a member please head over to www.SFTA.org.uk.